It took me some time, but I finally did it. I love Why Girls Are Weird - it's one of my favourite blogs, along with Habitual Homebody (aka The Curious Pug), VividPlease, and a craft blog that I can't remember the name of. But Krysten had presented a wonderful idea! 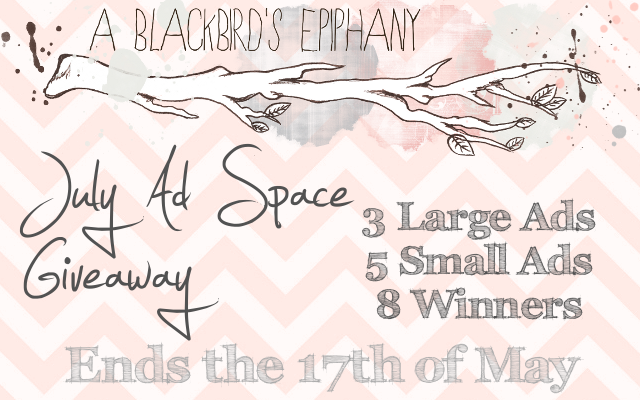 Not many people are shelling out for ad spaces anymore, and I'm not talking about my own blog, but Krysten decided that, instead of having people pay for ad spaces, and having a lot of repeat sponsors and such, she would give everyone the chance to advertise on her blog with a monthly giveaway. I thought it was genius. I contacted her and asked if it was okay that I steal the idea, and with her consent, I've finally gotten around to doing it. I've never had too many sponsors on my blog. For the most part, it's just friends or blogs I adore. And so, my sponsor section is often ignored, eventhough I changed it to allow all sponsors the right to submit a guest post and/or giveaway. But this idea will help. I think the biggest issue I have is not knowing where to advertise that I'm looking for sponsors, but a giveaway will draw in all kinds of people. What I've decided to do, for now at least, is to leave it at only two entries per person. This gives everyone very equal opportunitues. The first is to simply follow my blog through Bloglovin', which is my absolute favourite platform. The second is to tweet the giveaway, giving more people the chance to get a free ad space, to give my blog more exposure, and so that I might also see new shops and blogs via winners. I had planned to do this a few months ago but I kept forgetting, so here it is now. It's all open internationally, of course, and the ad spaces can be used towards any page of yours you wish to expose, be it a blog, shop or website. Winners will be notified by email, along with how long they have to submit their ad, how to submit their ad, and when I need guest post and giveaway confirmations by. Guest posts and giveaways are not obligatory, but at least one of the two is preferred. Please make sure that your rafflecopter account has a valid email address. The ad size given to winners will depend on the order they are drawn, and cannot be changed. I also require adverts of the correct size. Ads that have been stretched will not be accepted. Also, the prettier the ads, the better. Ads will go live on June 1st. If you win or lose this month, you can still enter next month! Bank Holiday Sale! - 30% off! Butterfly Friendship Necklaces Are Back!